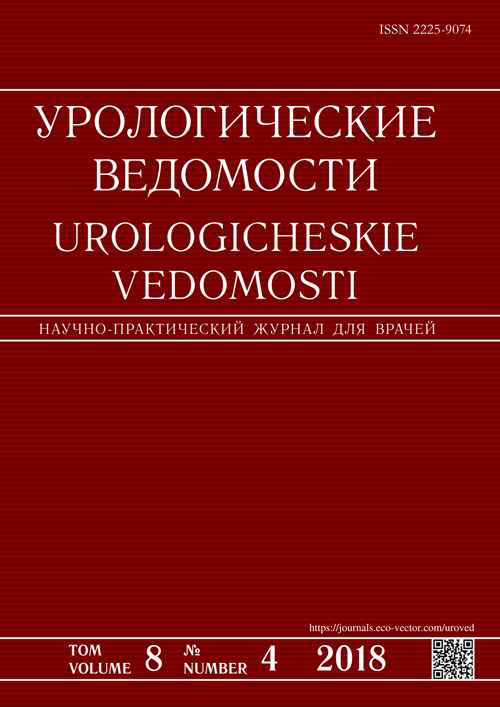 The quarterly scientific and practical journal «Urologičeskie vedomosti» was found in St. -Petersburg in 2010. The fundamental and clinical aspects of urology concerning the etiology, risk factors, epidemiology, clinical current, diagnostics and treatment of the different urological diseases are publishing in the journal. The problematic of the articles includes the questions of general urology and different aspects of the urological science – neurourology, andrology, oncourology, male reproduction and the others as well as the allied trades. The journal is issued with the assistance of the Department of Urology, St.-Petersburg State Pavlov Medical University, and S.P. Fyodorov Saint Petersburg Scientific Urological Society. Kalinina S.N., Korenkov D.G., Fesenko V.N. Basok S.M., Kyzlasov P.S., Kobzarev A.P., Sagradov S.K., Dolbilkina E.Y.